The largest insurer in Tennessee has announced it will no longer cover prescriptions for what was once a blockbuster pain reliever. 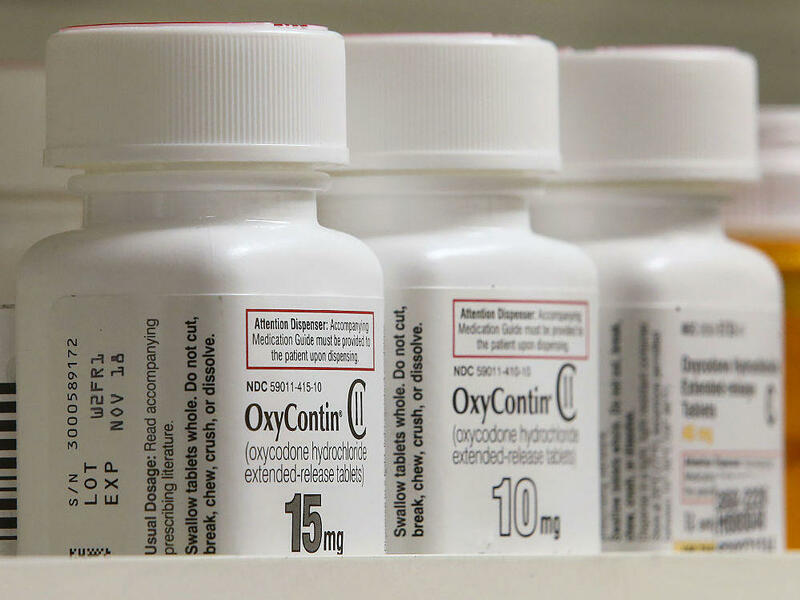 It's the latest insurance company to turn against OxyContin, whose maker, Purdue Pharma, faces dozens of lawsuits related to its high-pressure sales tactics around the country and contribution to the opioid crisis. Last fall, Cigna and Blue Cross Blue Shield of Florida both dropped coverage of the drug. Top officials at Blue Cross Blue Shield of Tennessee say newer abuse-deterrent opioids work better, and starting in January, the insurer covering 3.4 million Tennesseans will pay for those opioids made by other pharmaceutical companies instead. "We felt it was time to move to those products and remove Oxycontin from the formulary, which does still continue to have a higher street value," says Natalie Tate, the company's vice president of pharmacy. OxyContin was reformulated in 2010 to make the drug harder to misuse — but it's still possible to crush or liquefy in order to snort or inject it. The latest long-acting opioids that Blue Cross Blue Shield of Tennessee is going to start covering — Xtampza and Morphabond — are harder to misuse, according to the company and some pharmaceutical experts. In a page-long response, a Purdue Pharma spokesman pointed out that no opioid drug is "abuse proof" or less addictive, accusing Blue Cross Blue Shield of financial motives that remove choices for many patients. "We believe that patients should have access to FDA-approved products with abuse-deterrent properties," Purdue's Robert Josephson wrote in an email. "The recent decision by Blue Cross Blue Shield of Tennessee limits prescribers' options to help address the opioid crisis." In response, Blue Cross Blue Shield's Tate argues ditching one of the most recognized names in opioids is not designed to save money, though it could in a roundabout way. This move could reduce fraudulent prescriptions to street dealers or drug-seeking people with active addictions and cut down on costly hospital stays for overdoses, says pain consultant and pharmacist Jeff Fudin, an adjunct professor at Albany College in New York. "It's a smart idea to use dosage forms that have proven to have been better abuse-deterrent formulations," he says. "In the long run, it actually will cost them a whole lot less money." Fudin says he's often at odds with insurers over their decisions about which drugs to cover, but he applauds this decision, which he expects more insurers to follow. Practicing pain physicians in Tennessee — who regularly battle with insurance companies — also approve of the change, though they say OxyContin was already falling out of favor. And they argue trading one opioid for slightly safer ones doesn't address a larger gripe that physicians have with insurers over paying for other, non-addictive types of treatment. "We will have denials and prior authorizations on a muscle relaxer, and we will have no issue getting an opioid through the insurance company," says Dr. Stephanie Vanterpool, an anesthesiologist at the University of Tennessee and the president-elect of the Tennessee Pain Society. "The physicians or the doctor's offices jump through hoops to get the better medication for the patients. And when I say better medication, I mean the medication that's treating the cause of the pain, not just the medication that's covering up the pain." Blue Cross Blue Shield of Tennessee is adding some alternative pain therapies in the coming year, according to its announcement last week. But Vanterpool wants a philosophical about-face. Not to say OxyContin won't be sorely missed by some patients. "There are plenty of people who benefit from that drug," says Terri Lewis, a patient advocate and rehabilitation specialist from Cookeville, Tennessee. She's suspicious of Blue Cross Blue Shield's motives since the insurer may be blamed for its role in the opioid crisis. Embattled Purdue Pharma could be a convenient scapegoat. "Maybe this is a good decision," Lewis says. "But it smells like a political decision." And this would be just the latest decision inserting politics into a nuanced medical problem. The Tennessee legislature instituted some of the tightest opioid prescribing regulations in the country this year — a three-day limit for most people who aren't already on opioids. And even long-term pain patients are having trouble getting refills. John Venable of Kingsport, Tennessee was shown the door by his pain clinic in July after more than a decade on oxycodone — a generic, short-acting version of OxyContin. "I just felt like I was in a hopeless state, like, 'there is no help for John,'" he recalls. At their worst, he says his headaches get so debilitating "that death would be a relief." Despite his dread, he's noticed something surprising over the last few months without opioids — his crippling headaches haven't gotten that much worse, if at all. "It very well might be a blessing in disguise," Venable says. The retired builder and one-time pastor says he prays that those losing OxyContin also will get to use the moment as an opportunity, though he knows many can't cut ties with opioids. And he worries some will turn to more dangerous drugs off the street or even contemplate ending their own lives. Experts point out that the number of opioid prescriptions has already been falling around the country. And in Tennessee, Blue Cross Blue Shield has experienced a 26 percent drop in opioid prescription claims over just three years. But restricting legal access to opioids hasn't turned back the rise in overdose deaths, which hit a record in Tennessee and nationwide last year. This story is part of a reporting partnership that includes Nashville Public Radio, NPR and Kaiser Health News. Purdue Pharma, the maker of OxyContin, is the subject of dozens of lawsuits around the country. Now the largest insurer in Tennessee has announced it will no longer cover prescriptions for what was once a blockbuster pain reliever. Blake Farmer of member station WPLN in Nashville reports. BLAKE FARMER, BYLINE: OxyContin was designed to be difficult to misuse, pain relief delivered over a longer time. But when crushed and snorted or liquefied and injected, the extended-release tablets turn into a potent rush. Natalie Tate is the top pharmacist at Blue Cross Blue Shield of Tennessee and says the newest abuse-deterrent opioids work better. And so starting in January, the giant insurer will cover those instead. NATALIE TATE: We felt it was time to move to those products and remove OxyContin from the formulary, which still does continue to have a higher street value. FARMER: The newest drugs are more expensive, but Tate says Blue Cross will pay the difference. In a page-long response, a Perdue Pharma spokesman points out that no drug is abuse-proof or less addictive, accusing Blue Cross of financial motives. Tate says ditching one of the most recognized names in opioids is not designed to save money, though it might in a roundabout way. Pharmacist Jeffrey Fudin, who's a professor specializing in pain, says he's no fan of Blue Cross, but he applauds the decision. JEFFREY FUDIN: Yes, it's a smart idea to use dosage forms that have been proven to be better abuse-deterrent formulations so that in the long run, it actually will cost them a whole lot less money. FARMER: Fudin says insurers could cut down on prescriptions that get misused and costly hospital stays for overdoses. Practicing pain physicians in Tennessee say OxyContin was already falling out of favor. But they have a more basic problem with how insurers cover pain treatment. Many are quick to deny coverage of alternative therapies like muscle relaxers or nerve-numbing procedures. Stephanie Vanterpool, the incoming head of the Tennessee Pain Society, says there are better medications for the patient. STEPHANIE VANTERPOOL: And when I say better medication, I mean the medication that's treating the cause of the pain, not just the medication that's covering up the pain. FARMER: Blue Cross of Tennessee is adding some alternative pain therapies in the coming year. But Vanterpool is really talking about a philosophical about-face. Not to say Oxycontin won't be sorely missed by some patients. TERRI LEWIS: There are plenty of people who benefit from that drug. FARMER: Terri Lewis is a patient advocate from Cookeville, Tenn. She's suspicious of Blue Cross' motives since the insurer has a corporate image to protect. Purdue Pharma could be a convenient scapegoat. LEWIS: Maybe this is a good decision, but it smells like a political decision. FARMER: And this would be just the latest political decision targeting a nuanced medical problem. The state Legislature instituted the tightest opioid prescribing regulations in the country this year, and even long-term pain patients are having trouble getting refills. John Venable of Kingsport, Tenn., was shown the door by his pain clinic in July. JOHN VENABLE: I just felt like I was in a hopeless state. This is my life - to wake up every morning with a headache so bad that death would be a relief. FARMER: Despite that bleak outlook, he's noticed something surprising over the last few months. Without the opioids, his crippling headaches aren't that much worse, if at all. VENABLE: It very well might be a blessing in disguise. FARMER: Venable, a builder and onetime pastor, says he prays that those losing OxyContin might also find they can manage without. But he worries some could also turn to more dangerous street drugs. For NPR News, I'm Blake Farmer in Nashville. SHAPIRO: This story is part of a reporting partnership that includes WPLN, NPR and Kaiser Health News. Transcript provided by NPR, Copyright NPR.